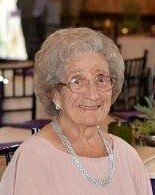 Jennie C. Zappitelli, age 95, of Conneaut died peacefully in her sleep, Friday, March 23, 2018. Jennie was born on March 28, 1922 in St. Angelo-EnGrotto-Campo Bosso, Italy, the daughter of Nichola Bertone and Adolorata Vendetti. Jennie married Angelo Zappitelli in 1948 in Italy and would later move to the United States. Jennie was a housewife and homemaker her entire life. Jennie was a member of Corpus Christi Parish and the former St. Philip & Mary Altar Rosary Society. She enjoyed housework, yardwork, gardening, cooking her favorite Italian recipes, Italian meatballs and sauce, baking cookies and crocheting. Jennie loved the time she spent with her family and friends and especially enjoyed traveling to Florida and Canada to visit family. Jennie is survived by her daughter Marie Ely of Conneaut, daughter Yvonne and Phil Splan of Kissimmee, Florida, sons Nicholas and Dorothy Zappitelli of Ocoee, Florida and Anthony and Mary Zappitelli of Conneaut, daughter-in-law Barbara Zappitelli of Conneaut, seven grandchildren, 15 great-grandchildren, 3 great-great grandchildren and a sister Carmella Cardella of Stanford, CT.
Jennie was preceded in death by her first husband, Carmine Bertone who died in WWII serving in the Italian Army, second husband Angelo Zappitelli, 1983, son Albert Zappitelli, infant twin daughters and son-in-law William Ely. Calling hours will be held from 10:30 a.m. to 12:30 p.m. on Wednesday, March 28, 2018 at the Raisian Family Funeral Home, 581 Harbor St., Conneaut. Mass of the Christian Burial will be held at 1:00 pm. on Wednesday, March 28, 2018 at St. Frances Cabrini Church with Fr. Philip Miller of Corpus Christi officiating. Memorial contributions in memory of Jennie can be made to Corpus Christi Parish or St. Jude’s Foundation. Envelopes will be available at the funeral home.